Whether you want to advertise at a hotel lobby or a club, the Indoor Advertising LED TV Display is your perfect choice. Its aluminum alloy frame and tempered glass face keeps it safe from any damage, and fashionable design & picture-perfect display grab the attention of viewers. It features Apple TV, loudspeaker, control card and power supply port built-in. Simply plug it and start playing. Very convenient to use and require no technical knowledge to operate. Its integrated design makes it look neat-and-clean. Measuring 2800x1490x150mm, it features the perfect proportion of width and height, enhancing the viewing experience to great extent. Thin size makes it ideal for displaying at museum, art gallery or hotel lobby, as it appears like an animated painting. It can be used to show your advertisement at a shop, a picture gallery at an art exhibition or movies at hotel lobby or clubs. Connect your external storage device or connect it to internet. A great entertainment tool which helps your visitors spend their time easily. Indoor Advertisement LED TV display can be easily placed at any place, replacing those still posters. Adaptive to the surroundings - it's capable of changing your room settings. Place it in your bar, and you will see the difference. Your customers will be more attracted. Crystal-clear picture quality and clear sound change the environment, making your bar a better place to be at. Connect it to the internet and it becomes a smart gadget. 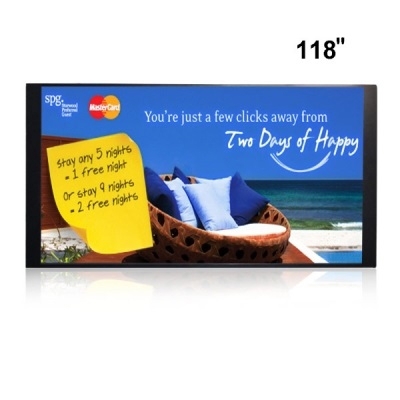 The Indoor Advertising LED TV Display supports dozens of languages, making your customers feel home. It can play what your customers want to watch or listen. connect it to Wi-Fi and it can send pictures to any iOS device. A smart TV with smart functions - so you may also use it in schools or colleges for demonstration, teaching and training. It's an entertainment tool when used as a TV, and a money making tool when used as an advertising panel. Making money with entertainment is beautifully combined. Connect your Indoor Advertising LED TV Display with your iPhone, and you have all control in your hands. Work from home or anywhere.